The weather was perfect, we enjoyed a long walk and were settling in to watch IPL (Indian Premier League Cricket) match. There was just the question of dinner. We looked around in the fridge and pantry and saw the Maggi packets peeping out. We always keep a couple of packets for moments like this. For this meal we decided to jazz up our dinner. 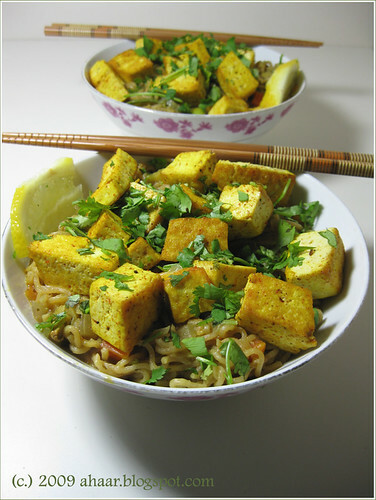 Growing up we both liked Maggi plain, without any additions, just like they showed it in the advertisements. We can't do that anymore. For this meal, we cooked the Maggi as per the instructions, then tempered oil with cumin seeds and chopped onions, then add some chopped carrots, peas and beans and mix it with the Maggi noodles. 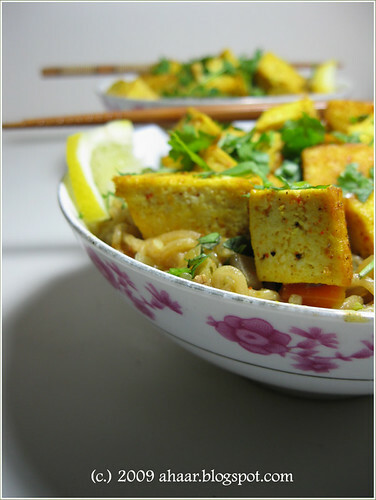 We then topped with some sauted Tofu, cilantro and a wedge of lime. One satisfying meal. How do you like your Maggi? 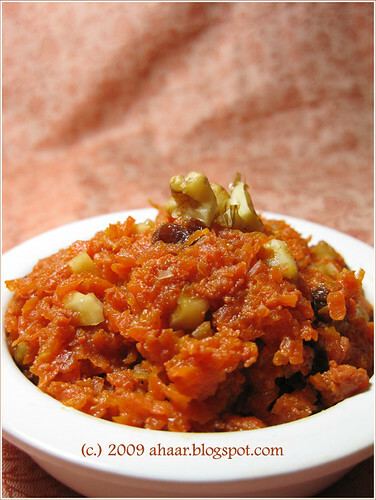 Gajar ka Halwa is probably one of my favorite winter sweets. In India, especially in the north, you can see this cooking in a big kadai (wok) in a local sweet shop. If you were to ask for some, a mithaiwala would take a portion from the wok, mix it with some meva in a separate tawa, top it with some nuts and serve it piping hot. Yummy! It's an annual ritual at home too. My mom would make a big batch of halwa and I loved eating the leftovers the next day. Since I didn't make it during the winter this time, I had to make it soon. Here is how I made it. Roast the nuts and raisins in a 1/2 tbspoon ghee and keep it aside. Bring the milk to a boil in a heavy bottomed pan. Then add the shredded carrots and let it cook on medium heat for 5-6 and then reduce it to low. Let it cook for another 10 minutes, then add in the sugar and let it cook on low heat. Cook till the halwa is mixed together, the milk has evaporated. Now heat the rest of the butter/ghee in a separate pan, add the halwa and cook till it starts leaving sides. Add in the cardamom powder. Mix well and garnish with roasted nuts and raisins. Serve warm or cold. It's been a while since I did anything in my "corner" on Ahaar. And I know I haven't responded to the many kind comments we received for the very first post about thanjavur marathi food. But now that the semester is over, I hope to post more often and perhaps even dig up some interesting tidbits about thanjavur marathi cuisine. 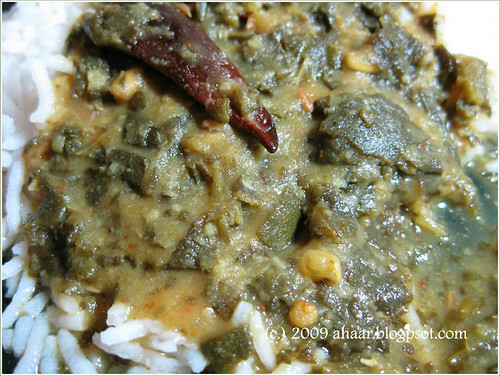 To get things started again, here's a recipe for Pala Ambat Bhaji (Pala: greens; ambat: sour; bhaji: vegetable dish). 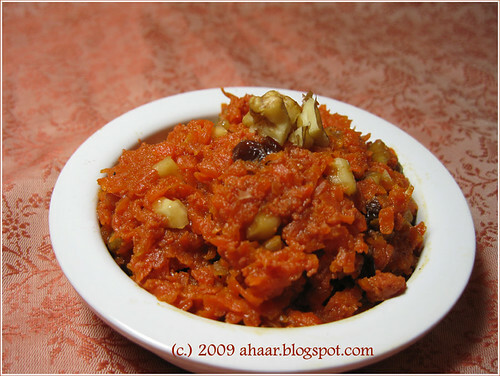 The ambat comes from the use of tamarind and ambat bhaji is usually made with different kinds of greens or cabbage. And to liven things up, we fry a few mor milagai (see this) to go with the ambat bhaji. Ambat bhaji makes for a nice variation from sambar and kootu. Here's the recipe. Boil toor dal. In a pan, heat oil and temper with some cumin seeds, red chillies, and methi seeds (be careful to not heat the methi seeds too much or they turn bitter). Add chopped spinach to this and cook with a little water till the raw smell of the greens is gone. To this, add tamarind juice and let this cook for about 5 minutes. Then add the boiled toor dal, salt, and let it cook for about 10-12 minutes on low-med heat. Spring is slowly spreading through the garden. 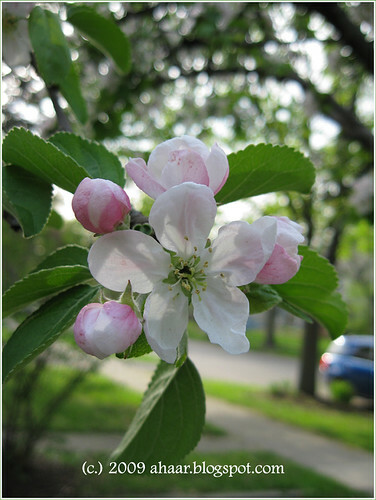 I was happy when I got the vegetables from Farmer's Market last week, but I am even more excited because the apple tree in front of the house is in full bloom. I see bees hovering over the flowers and it makes a pretty sight whenever I open the door. 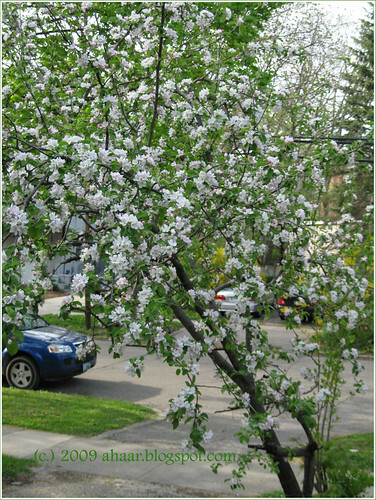 But most of all, it's a reminder that I'll be getting some delicious apples pretty soon! With our busy schedule this past week, we've been trying to do some quick cooking. This week, I made a quick roasted vegetables with inspiration from Jugalbandi. 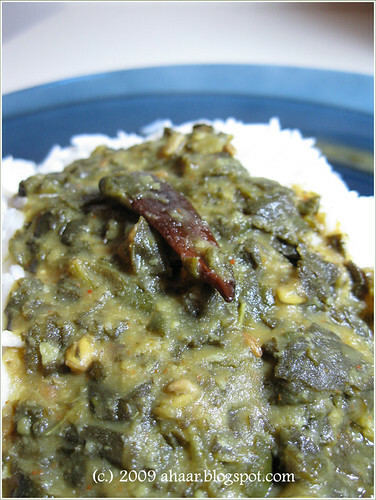 It was delicious, healthy and a great combination with spinach dal and rice. Preheat the over to 400deg F. In the meantime, sprinkle the vegetables with the spices. Take a baking sheet, and then put pat half the olive oil on the sheet. The rest of it, add it on top of the vegetables. 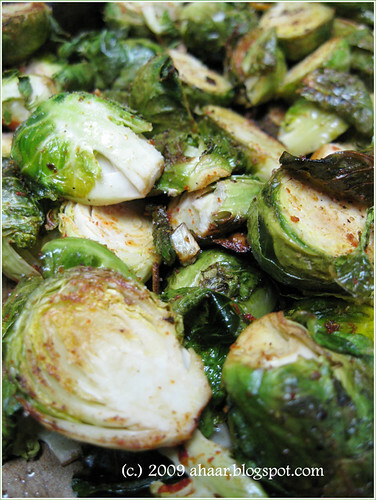 Bake for 20-25 minutes till the vegetables are done - the Brussels sprouts start to get crisp and brown. 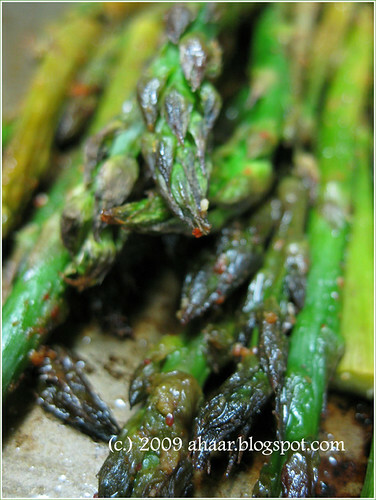 Serve it warm as a side dish or as part of a salad.